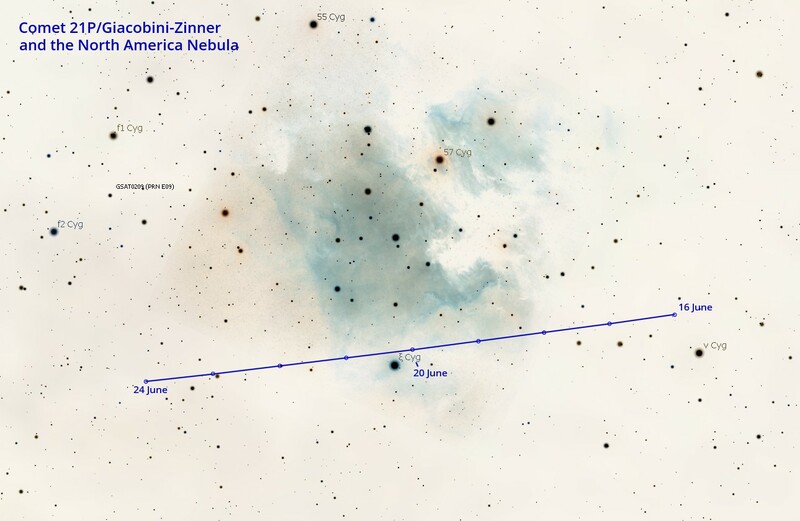 At the time of writing Comet 21P/Giacobini-Zinner passed 58 Cygni (Latin v Cygni) a binary star in Cygnus which shines at magnitude 3.94 and 6.40. This means the comet is fast approaching the Mexico region of the North America nebula (NGC 7000) making for a good photographic opportunity. This news comes with a sting in its tail for those located at higher latitudes however. As we have almost reached the Summer Solstice, those located above 50 deg N latitude will have far from ideal sky conditions. The Sun will not sink far below the horizon all night meaning that astronomical darkness is never reached. Those of you located in the UK and northern Europe, Canada or the northern states of the USA will have to battle with twilight. Not ideal for an object such as the North American nebula which requires a decent amount of exposure time to reveal good detail. 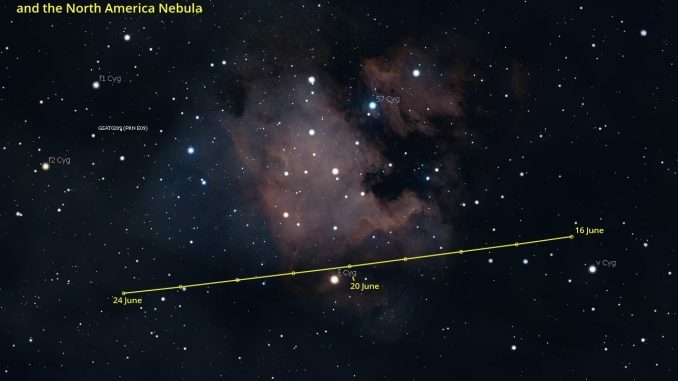 Comet 21P will enter the boundary of the nebula around the 17 June and will pass 3rd magnitude star ξ Cygni on the night of 19-20 June leaving the nebula’s boundary a day later. 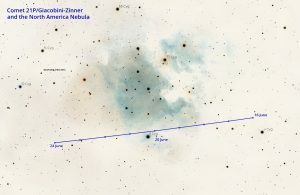 Below is a finder chart for this time period. The short period comet will brighten rapidly through July and August and is hoped to possibly reach naked eye visibility. As night-time darkness conditions improve, 21p remains well placed for observation for most of the summer visible in the late evenings. The comet reaches perihelion on 10 September 2018 at a distance of 0.39 au from the Sun. 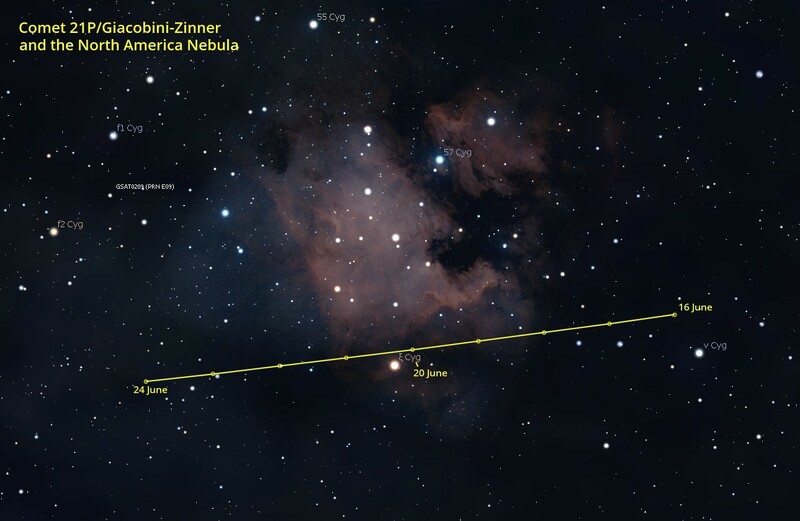 Comet 21P Giacobini-Zinner on the evening of June 19, 2018, taken while “skirted Mexico” of the nebula North America and Pellicano. Location Montecassiano (MC – ITALY).